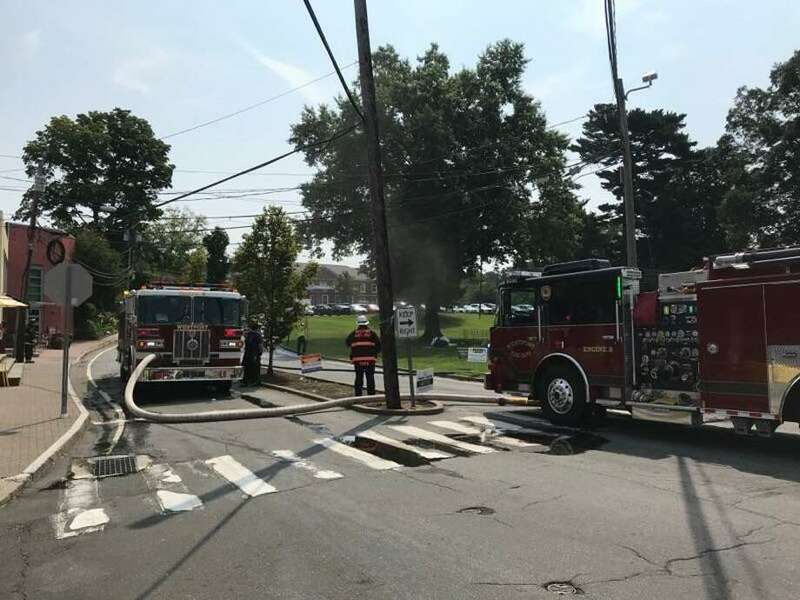 The Westport Fire Department responded to a gas leak after a high-pressure line was ruptured Monday, Aug. 27, 2018. Several buildings were evacuated due to the leak. WESTPORT — A hissing sound led to the discovery of a several-day-old gas line rupture and the evacuation of several buildings in downtown Westport on Monday. The leak did not become evident until a Stamford Tent & Event Services Inc. began to remove a large tent on Jesup Green erected for the Melissa Ethridge concert Saturday night. When a “hissing” was heard, according to fire officials, crews were dispatched to the scene. Westport Fire deployed a protective hose line and evacuated the surrounding buildings. Evacuations included three commercial occupancies and the Gillespie Center. The first arriving fire unit reported a high-pressure gas line had been cut, according to Assistant Fire Chief Matthew Cohen. Southern Connecticut Gas was notified upon dispatch of the call and responded. There was no shutoff readily available near the cut line and the gas company had to crimp the line to stop the flow. Cohen said it is undetermined if fines will be dolled out as fallout from the leak. The fire department responded with two engines and the shift commander. The rescue company was clearing off of another call in the area and responded as well. All of the surrounding buildings were metered for gas readings. Police responded to assist with traffic and crowd control, and Westport EMS later responded to assist with rehab. This procedure was performed while firefighters stood by with a hose line to protect the gas company employees. The gas line was crimped off and the fire department rechecked the gas levels at the surrounding buildings. Once complete, the occupants were allowed to return and the business reopened.